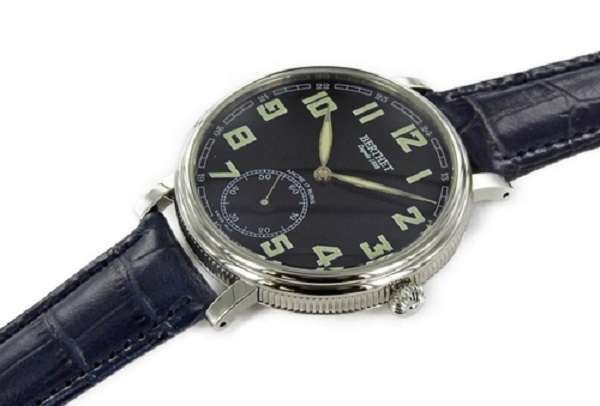 The watch named Vintage, reference H46, by Berthet is in the early aviator style, with large Art Deco style numerals coated with luminescent paint on a black dial, and a generous 46 mm size that gives it a lot of presence on the wrist. It combines several features that make it a very attractive piece. The pilot’s watch aesthetic, which is always popular; a display caseback, which allows you to see the movement; and the hand-wound movement. Personally I love the morning ritual of winding up a hand-wound watch, and it gives me an opportunity to watch the movement, with its Côtes de Genève decoration, blued screws and pink rubies, and the balance wheel spinning back and forth six times a second. 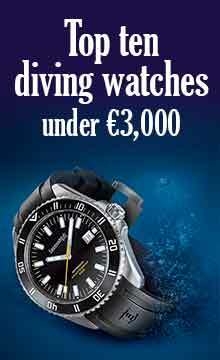 And the other nice feature is the price: €495. The Vintage Aviateur by Berthet is fairly slim at 11 mm thickness, with a fluted caseband that adds an extra classical note, and a fluted crown to match. The watchglass is slightly domed, and the display caseback is in flat mineral glass. 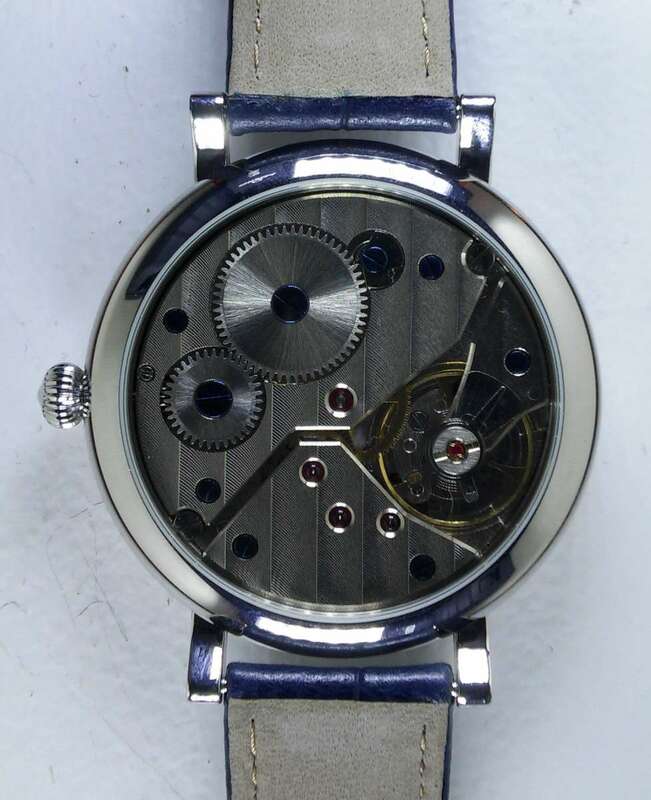 The watch has a water resistance of 5 atm. The strap is in leather with a pin buckle. The Vintage Aviateur H46 is powered by a Swiss-made movement, presumably the ETA Unitas 6498-2, personalized by Berthet. It is 37 mm in diameter, and it has a balance running at 21,600 vibrations per second, 3 Hertz, 18 jewels, and a power reserve of 48/50 hours. The 6497 and 6498 movements were first introduced in the 1950s and still today they remain amongst the toughest and most stable movements around. Though they don’t have the stop-seconds feature, they can be regulated with precision by any watchmaker and they can provide exceptional accuracy. 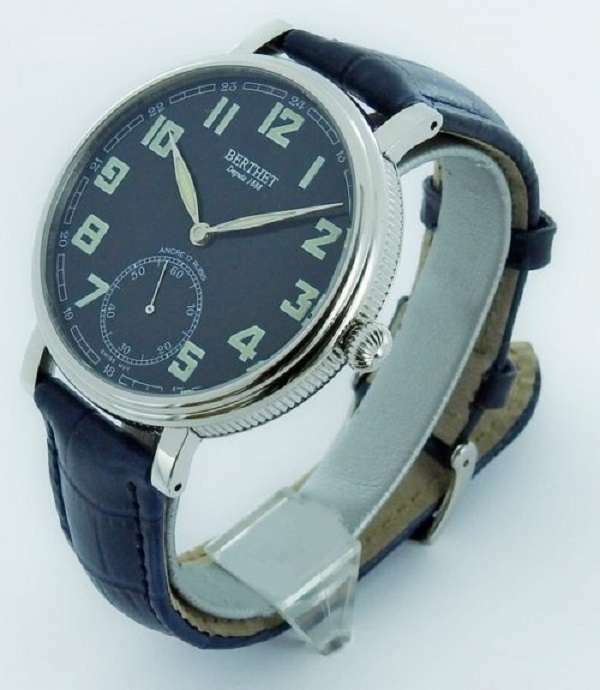 The Vintage Aviateur H46 by Berthet costs €495, and it is available from the Berthet website.